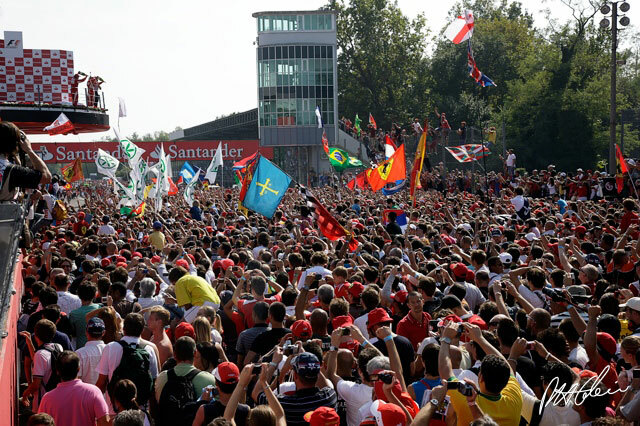 Fernando Alonso won the Italian Grand Prix in a Ferrari in front of the fervent tifosi at Monza, throwing open the world championship battle once again. With Lewis Hamilton out on the opening lap after contact with Felipe Massa's Ferrari, Jenson Button finishing second and both Red Bull drivers in the points, the title fight is still most definitely a five-man battle. Alonso said: "It's only really possible to compare this victory with Spain in '06 - a very special feeling. And the result, knowing that Webber was only sixth and Hamilton had a problem, is very important for the points gap but, as I said coming into the race, our chances don't depend on what the others do, we need to find consistency for the last five races." "The first lap was stressful - not so much the start itself, because that was good, but obviously Jenson had a better one. I tried to move over off the start but Jenson was already there and I couldn't defend. Jenson also took up a good position for the first corner and when I tried to negotiate the first corner I touched his left rear wheel and jumped a bit in the air. When the car landed I touched Felipe on the right. Two touches in a few metres... I thought something would be damaged and I might not be competitive, might have some understeer, so for the first couple of laps I was checking but everything was fine and I started pushing." "I wasn't just waiting for the pit stop. I attacked Jenson and had confidence because I was close enough out of Parabolica to take the benefit from extra straightline speed, so I was pushing but Jenson was driving superbly and he didn't make a single mistake on the whole lap anytime, so the gap at Parabolica was always the same." "When Jenson pitted we knew we had one lap to make the difference, so I pushed 100% and it was a great pitstop, the fastest I can remember. By the time you do all the buttons I didn't even have first gear in when the green light came, so thanks to the team for a perfect stop. When I looked in my mirror I thought I had the lead easily but Jenson was coming at 320kph and it ended up being close and I nearly spun on the new tyres at the chicane." "Then, towards the end, I had a moment at the first chicane again. I had Pedro de la Rosa in front of me for a lap and a half and in the first chicane I thought he was letting me by and I braked a bit late to avoid him, but went straight and had to go over the big bumps and slow right down not to damage the car." Button was disappointed to miss out on a third win this year but satisfied that the 18 points at least puts him back in the championship battle. In the collecting room before the drivers went out onto the podium, he asked Ferrari team principal Stefano Domenicali if he knew what the points situation was. "No," Domenicali answered. "Come on," joked Jenson, "what've you been doing?" The answer is that Button now retakes fourth place in the title race from Vettel and is just 22 points behind Webber's lead. "I think going for the higher downforce set-up was the right choice," Jenson said. "The start was good and we calculated that in the run to the first corner I shouldn't lose ground and would be strong under braking. It went even better than plan. I didn't feel the touch with Fernando but for me the whole race was tough." "I spent the whole time looking in my mirrors judging how far Fernando was behind and that's quite hard because the mirrors shake so much. I didn't have quite the pace I expected, the Ferraris were super-fast and I never got more than 1.4-1.5s away and was surprised how close they stayed through the corners. But, I managed to keep Fernando behind until we pitted one lap earlier, which maybe was a mistake. When I went out on the prime tyres I just couldn't find grip and for me that's where I lost time." Team mate Hamilton, with a low-downforce, high top speed set-up, knew he had to inflict maximum damage on those around him as the red lights went out and over the rest of the opening lap. He made a fine start, blasting past Webber's fourth placed Red Bull, then tried to get up alongside Massa's Ferrari into the second chicane. There was contact between his right front and the Ferrari, however, and when they reached the Lesmos, Hamilton's wheel was broken and he ended his race in the gravel trap. "Mistakes like that can cost championships," a grim-faced Hamilton admitted. Nico Rosberg and Robert Kubica were both big winners in the first lap sort-out, as the Red Bulls went deep into the first chicane and got slow exits. They settled down into fourth and fifth place ahead of Nico Hulkenberg, Vettel, Schumacher and the slow-starting Webber. With Webber safe in the knowledge that championship leader Hamilton was out, he needed to make safe progress up the order but the first task that faced him was getting past Schumacher. "We thought it might have been a long afternoon for him..." admitted team principal Christian Horner, but Webber outbraked the seven times champion into the first chicane on lap 6. Then, on lap 20, he was past team mate Vettel after the young German slowed suddenly on the run down to Parabolica. Anyone who imagines this might have been team orders is sadly misguided - there is no way that Vettel would play ball in that scenario. He radioed in complaining of a problem with the engine under acceleration. "We're not sure what happened," Horner said, "it could have been a tear-off strip going into the airbox or it could have been a rear brake binding on temporarily if Sebastian had run it over a kerb. We saw a brake pressure spike but we'll have to have a proper post mortem when we get the car back." The problem righted itself, however, and Vettel was still in the hunt. He went on to score a damage limiting fourth place when he ran right until the penultimate lap on the option tyre before pitting for a set of primes. The right strategy regarding tyres was a close call. The race pace of the non championship-contending cars - Rosberg's Mercedes, Kubica's Renault and Hulkenberg's Williams-Cosworth - was strong and no gaps were opening up to drop into after pit stops. Kubica was the first of the front-running cars to pit for tyres, after 33 of the race's 53 laps, and immediately set a sector three best on his out lap, which everyone started reacting to. Unfortunately for the Pole the stop was a slow one and he lost a couple of seconds and saw Hulkenberg pit out alongside him on the inside for the first chicane. On the exit Webber also got a run on him and relegated the Renault another slot. Webber now set about Hulkenberg, who twice ran straight on at the first chicane and once at the second, without penalty. "He seemed to spend every second lap going through the chicane but the stewards left him alone, which was frustrating," the new championship leader said. That played into the hands of Vettel, who ran his long stint on the option tyre. "That strategy was a risk but I was watching the lap times throughout and it worked out for us today and we achieved the maximum today, which was fourth," Vettel said. Hulkenberg's seventh place was his second strong result in three races and was pleasing for Cosworth in its return season on a circuit which places the strongest demands on engines. Kubica, Schumacher and Barrichello completed the point scorers. Webber now leads the drivers' championship battle with 187 points to Hamilton's 182, Alonso has 166, Button 165 and Vettel 163. In the constructors fight, Red Bull keeps the lead with 350 points to McLaren's 347.